A straight hit from the tee will afford the average player a chance of hitting the green in two, though the three right side fairway bunkers can draw in the drifting ball. The left hand rough will cling to the pulled tee shot and this together with the pampas grass can conspire to add to the difficulty of the approach shot. 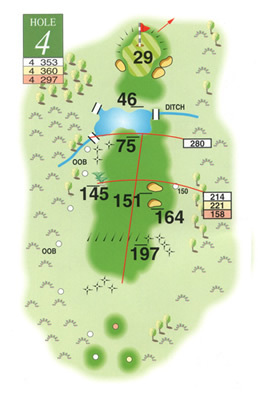 The pond that crosses the fairway is 280 yards from the back tees and is reachable with a supporting easterly but with the prevailing wind the decision with the shorter tee shot is whether to lay up or look to carry it. Three bunkers guard a reasonably large green but it is the pin position that will determine how hard the putting process will be.